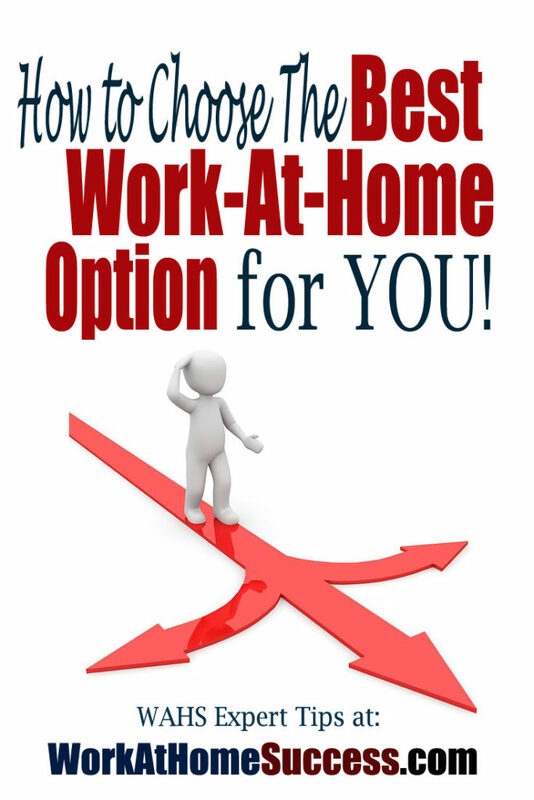 One of the most challenging times in the work-at-home journey is deciding the right home-based career option for you. Should you find a job and if so, what job is best? Should you start a business? Should you start from scratch or buy one? I asked experts to share their process or tips in how to choose a work-at-home options. 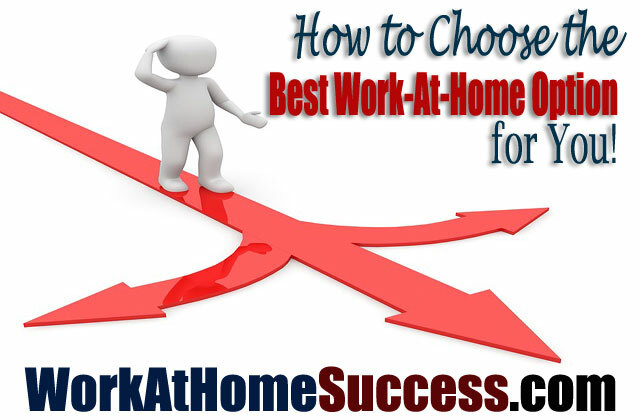 How to choose the best work-at-home option for you! Easy, first and foremost pick something that you love, so even in slow or difficult times, you’ll find the passion to make it work. You should start a business in the thing that everyone seeks out your advice for, even to the point of annoying you. For me, as I got close to reaching the end of working for corporations, I was tired of being bombarded with PR questions. People at other companies, friends, family, strangers, they all wanted PR tips and techniques I had spent a decade and a half gathering. And finally it hit me—I knew something about PR, maybe even quite a bit–and people were asking for my help. I realized that if people needed help, perhaps they would pay for it. This annoyance was my mother of invention. How should someone decide the best business to start? Really honing in on your passion is the best way to find out what industry you should start a business in. I was in law school studying international children’s rights when I realized the need for my cookbook series. Now I’m helping children to learn about how to volunteer and give back to their community just as I would have as a lawyer, but in a way I can be a lot more passionate about. Look for a real problem you’ve faced or seen other people face. Don’t start a company just because you want to, without trying to solve a real problem. If you want to be an entrepreneur, keep your eyes open for things that don’t work as well as they could. I think people should follow their passions or decide by expanding on their gift. I was good at massaging and painting. Enjoyed both but my passion was the music business. So I wiggled my way into to the music business by working for free and helping out where I can, did massage to pay the bills, and painted as a hobby. I have seen success in the music business and was the stepping stone to my current business of Black Millionaire Media, Inc.
Everyone has mad skills, figure out what yours are and then decide if you can make a go of it through a home-based business. Robert Ringer suggests in his book Million Dollar Habits asking yourself five basic questions: 1 – What do I enjoy? 2 – What am I good at? 3 – What do I want out of life? 4 – What’s the price? 5 – Am I willing to pay the price? I don’t think work should ever be a question of what I can do from home, it needs to be what do I enjoy doing and can I do that from home? If you choose to work from home and it is not something you enjoy doing, you will always be working on something else around the house and will never get anything done. A business in a field of which one has passion, knowledge and expertise. If one has passion but lacks knowledge and skill, they must have the resources to partner with others that have knowledge and expertise. I agree with what our experts have said. I believe you’ll find your BEST work-at-home option lurking in something you already know or love to do. That’s why I work so hard to steer you away from “money making programs,” surveys, and other gimmicks that aren’t really about building a home based career. In all the years I’ve done Work-At-Home Success and interviewed for the podcast, I’ve never met any successful home-based worker who made a living doing surveys and such. They all took skills, experiences and/or passions to find work or create a business. Use the Start Here section to give you the tips and resources to find your perfect work-at-home option.